Allen Air and Refrigeration can service and maintain all brands of chillers. However, it is our experience with Hitachi chillers that makes us your number 1 choice in Perth. Why choose Allen Air & Refrigeration for your Chiller servicing and maintenance? Our tradesmen have received more training in Sydney at Temperzone and Hitachi’s training centre, than any other person in Western Australia and we continue to extend our knowledge base when every opportunity comes up. Our training is part of our commitment as the state warranty agents for the Hitachi chillers. We are proud to be a part of this exciting product. 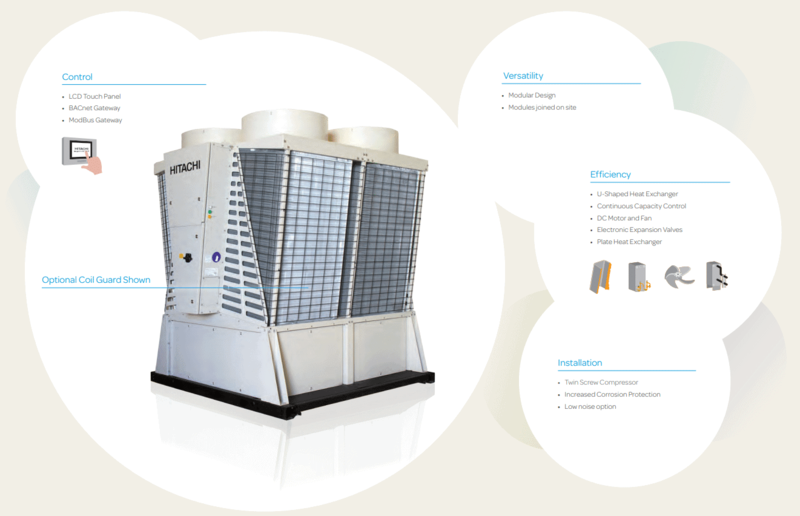 Each Hitachi Chiller module has its own compressor, regulators and refrigeration circuit. If a module should fail, the remaining modules maintain operational continuity, whilst Hitachi’s unique Dynamic Back-Up Control automatically starts any standby modules. Smart defrost, automatic restart after power failure, anti-freeze pump function and even automatic fan on/off for snow protection (OK – maybe not needed here in Perth, but they are pretty good as you can see) These features, as well as remote alarms enhance the “security of supply”. Compressors are Hitachi’s world-renowned screw compressors featuring continuous capacity control and their unique cyclonic oil chamber. The new rotor and lighter casing enhance efficiency. The new bearing system allows the overhaul period to be increased to 40,000 hours. The new AH series chillers are equipped with true Dual-type brazed heat exchangers, manufactured from stainless steel AISI316. These plate heat exchangers have two refrigerant inlets in order to improve the distribution of gas-liquid mixtures in the interior of the evaporator. The higher efficiency and compact nature of the refrigeration system allows for accurate control of the evaporation temperature. Also, the pressure losses on the inlet side has been significantly reduced, meaning a lower input of the circulating pumps is possible. This system used advance electronic controls to position the variable slide valve within each compressor. This makes a lineal capacity control within each module from 100% to 25%. Modulation allows for accurate chilled water temperature without the need for expensive inverters offering significant saving compared with step control systems. DC fan motors designed for quieter and more efficient operation and low sound emissions, U shaped heat exchangers and electronic expansion valves all add to the efficiency, whilst the LCD touch screen panel offers a user-friendly interface for the tradesman. If your chiller needs a service, contact us today for a quote!